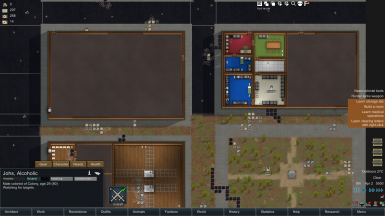 This mod generates a city when you create a new colony. 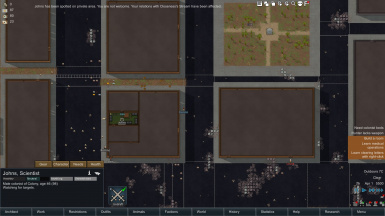 colonists are dropped in the city. It tries to simulate the behavior of inhabitants. If they don't trust you (goodwill<40) they will not like you to be in their home. But theft is not implemented yet. The city is randomly generated, it can be quite long. Between 1 and 2 minute on my laptop. At this stage, the mod is not finished. There can be some bugs and the gameplay needs to be improved. Known bugs : There is a problem when you try to generate a new city after having generated one before. You need to close the game and start it again. - put furnitures and people in hospitals, shops and restaurants. Fell free to tel me what you think !